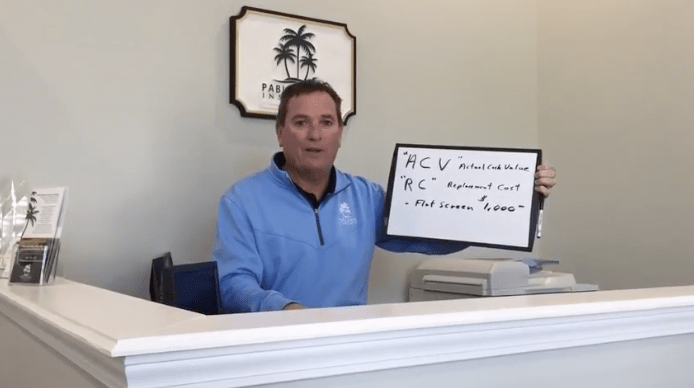 Today we’re going to talk about replacement costs versus actual cash value. If you live by price, you’ll die by price. What we try and do at Pablo Beach is insure our clients the way we would insure ourselves. When we talk about your contents in your home, we’re talking about we either want them replaced if there’s a loss or we want them depreciated. Replacement Cost “RC”, means you’ll be made whole if you have a loss. The big thing nowadays that people have are these big fancy, expensive TVs. Let’s just say you spend a thousand dollars on your 60-inch flat screen TV and lightning strikes your home and destroys your tv. If you have ACV, normally a life expectancy would be maybe 10 years on the television set. So, if you take 10 years and divide it by 10, 10% of the value that TV is going to depreciate year after year. So let’s just say if you had a TV that was 10 years old, was struck by lightning, and had ACV, you’re going to get $0 for that television. If you’ve got replacement cost, which is what we normally do, you’re going to get the TV replaced for full value. Don’t get caught up on price and price alone. Buy the insurance coverage you need, and that’s what we’ll do here at Pablo Beach Insurance. Time once again for "A Minute with PBIG" featuring Shaun Murphy. Today we look at "Actual Cash Value vs. Replacement Cost"This series is designed to remove the confusion around insurance terms and definitions. DON'T GET CAUGHT UP ON PRICE ALONE when purchasing insurance. Learn the facts with #WhiteboardWednesday.